We normally wipe and wrap our apples in newspaper and then in melon boxes in an old rabbit hutch to keep them fresh until march april time. This year we were over run with the amount so just put them in boxes and left a large amount in a massive wheel barrow in the carport and they've kept as well as the hutch apples. The variety is Discovery and are still crisp to eat. It may be a fluke but we certainly won't wrap next year to see if its the same. You were lucky they kept as well. Either the crop round here wasn't as good, or more were sold, because our local farm shop is pretty well out of English apples, even though there is a large storage facility near here. Might be as well to store some in the normal way and not wrap others. That way, if the season is different and not so good for storage, you won't lose all of them. Strange that 'Discovery' keeps, I really thought it was an none keeper. Many years ago now I inherited an orchard with 100 fruit trees and was advised that 'Discovery', a lovely eater, but to sell/eat as soon as possible as they would not last. Mine was not a keeper as I tried. Can there be, or indeed, are there different strains of that apple within the variety? 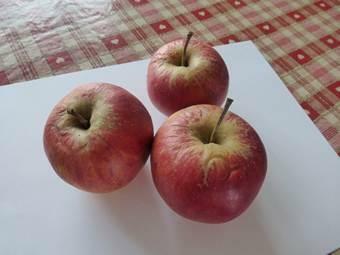 I have to buy apples now and usually have Royal Gala. Discovery, I was told, was the season's first eater to appear on the UK market and didn't last on the shelves. Thats what I'd learnt..I wouldn't be surprised if there were more strains. layered on newspaper, not touching each other in boxes or draws works pretty well. check em now and again . single layer in a coolish, mid humidity place is best. some will keep ok even if overlooked under a table in a warm room for a few months even if as picked and crammed in a rucksack. as gentle as handling an unstable primary at all stages of storage is good. no rubbing and certainly no washing, a gentle pick of any "bits" stuck to the skin is ok.
if multi layer storage is necessary for space etc no more than 4 layers to avoid gravity issues applied to layer one. apply normal anti vermin sop's for mice, rats, slugs and suchlike . another great way to keep apples is by drying. this works for keepers and eat immediately types . prep into slices, dip in citric acid solution or acidic fruit juice (lemon etc ) , dry windy and coolish. eat or use as slices or stick slices in a blender to make apple dust for sauces,cakes etc etc . By humid, is "damp enough to soften cardboard" too humid? As I wrote this post last month some of the apples have now turned but despite a wrinkled skin the flesh is still reasonably crisp. We bought the tree as a Discovery from Scotland Nursery in Matlock over 30 years ago but must admit we have always wondered if in fact it was a Discovery. Cobalt 60 seems the way to go . Any suggestions of type gratefully received. Photos taken today. it could be the semi randomly created, specific conditions of temp humidity airflow etc were so close to perfect that a non keeper lasted better than expected. My Discoveries were a lighter shade of red than that Derbyshiredowser, and definitely slightly flatter, with no russetting. The orchard that I 'inherited' has now gone and there have been 2 further occupants since me so not possible to go back for a look. The man who planted the orchard was a bit of an authority on gardening and he grew this orchard and left the map of what was there. His speciality was breeding dahlias, but his orchard was good. He took the dahlias with him when he left!